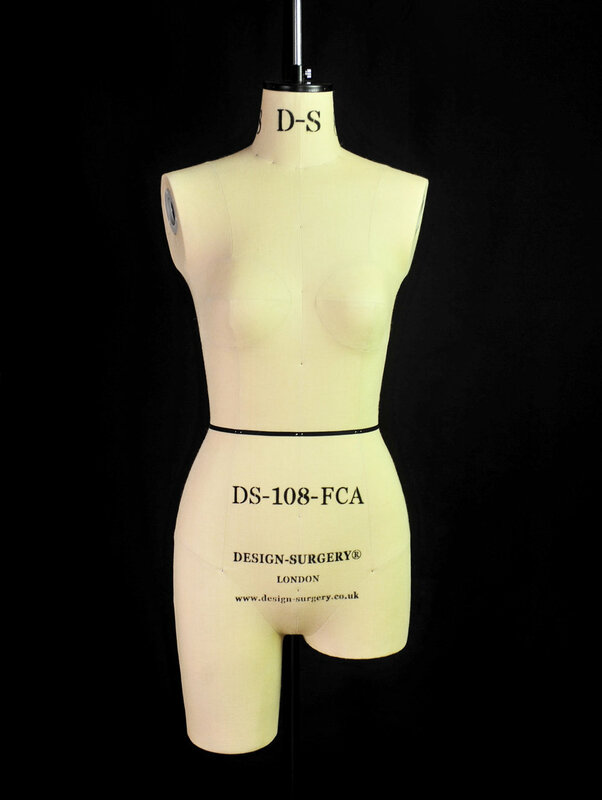 Design-Surgery® tailors’ dummies for designers, tutors and students, are created by people who work within industry and education and who experience first-hand the shortfalls of existing mannequins that are in use today. Our experience and knowledge, together with our passion and desire to create the best that we can, have gone into the design and production of our DS range of body forms. Each Design-Surgery® mannequin has been designed to be anatomically correct and more relevant to today’s body shapes and has been developed to provide designers and students with more information to assist them in judging proportions and style lines when working on the stand. As well as being more anatomically correct some models in the DS range have detachable shoulder-caps with true depth armholes, short mid-bicep detachable arms, and a removable short leg. The more natural body shape is more beneficial to the design and pattern cutting process than the other stands available, especially with close fitting garments. For students, the natural body shape gives encouragement and confidence to experiment, expanding their creative pattern cutting abilities without the need to have a live model regularly available to produce well-fitting garments. All body forms come with a sturdy, stable metal base with castors, and a foot pedal to adjust height. We produce the DS range of mannequins with an ethos of sustainability and ethical production. The torsos are hand-made from recycled materials in a traditional manner, and the metal pole and base are recyclable at the end of their life. Our range of soft heads, arms and legs have been designed to enhance your experience with our Design-Surgery body forms, and they can also be used with other makes of stands. We create each item in our North London Studio, where we hold stock of standard sizes for both male and female forms. We undertake commissions to individual specifications. We have selected a range of tools, equipment and consumables that we consider necessary and useful for students, pattern cutters and designers. All the products that we sell are used and tested by us in our studio or other working environments to ensure that they are functional, reliable and are good value for money. We provide pop-up shops to Universities, selling our equipment and stands to students. We can tailor packs to suit the needs of individual courses.